Apple's homepage again honors Dr. Martin Luther King Jr.
Apple is commemorating Martin Luther King Jr. Day in the United States by using its homepage to highlight the work and life of the civil rights activist. Visitors to the Apple website on Monday are greeted by a photograph of Dr. Martin Luther King Jr. that fills the page. 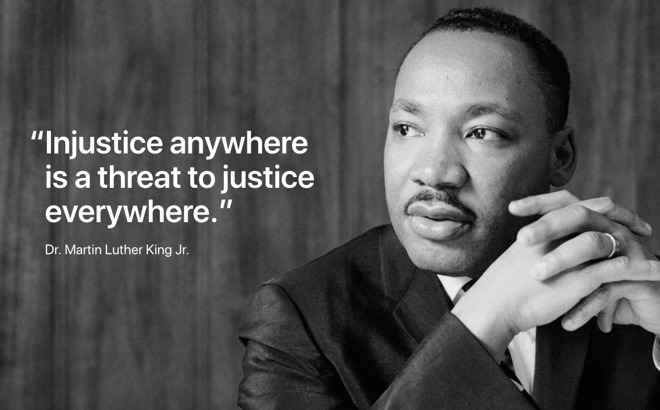 Alongside his image are the words "Injustice anywhere is a threat to justice everywhere," one of the civil rights figure's famous quotes. Apple CEO Tim Cook also paid tribute to King in a pair of Twitter posts. In one that uses the same photograph as the website, Cook asks for readers "let us remember our own duty to do good," before quoting King. An earlier post shows Cook thanking Apple volunteers and Dorsa Elementary students, who took part in an event in San Jose on Saturday. Cook advises King "called on all of us to make a career of humanity," before adding the quote "You will make a greater person of yourself, a greater nation of your country, and a finer world to live in." Martin Luther King Jr. was an American Baptist minister and an activist who helped lead the civil rights movement from 1954 until 1968, when he was assassinated. Best known for his "I have a dream" speech, King helped advance civil rights in the United States via nonviolent activism and civil disobedience, calling for an end of racial discrimination. The Apple website's commemoration is a continuation of efforts from previous years to mark Martin Luther King Jr. Day.